Pulling on my big girl undies... I ratted through my old unused scrapbooking supplies and found a little set of papers and stickers that would be perfect to start the personalisation of the most perfect diary/planning system in the world (no pressure there Suzanne 😕). Unfortunately I also discovered the old unused scrapbooking stickers can lose their stick resulting in hundreds of little alphabet stickers raining down like glitter... and getting everywhere. Nothing that couldn't be fixed with a generous application of gluestick and away I went. 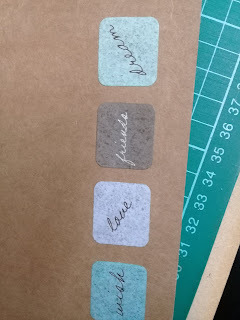 and these little word stickers were probably intended for some sort of mushy journaling but they also represented some of the things I love about quilting... so they got stuck on too! Friends, dream... create! 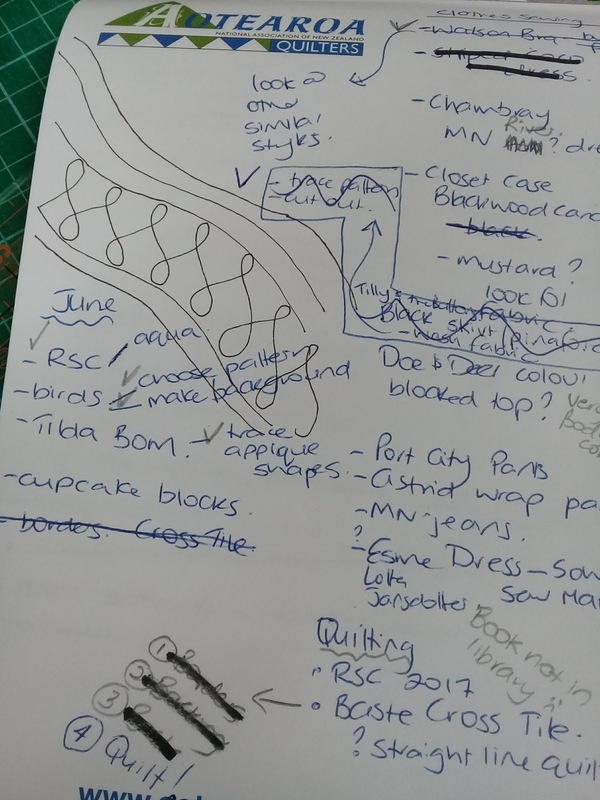 Why I hope this whole experiment will work is that I know I achieve a lot more when I write a list of intended tasks... this was a list from June showing a variety of projects; quilting and clothes, with a bit of brainstorming, quilting designs and flow charts all in one. 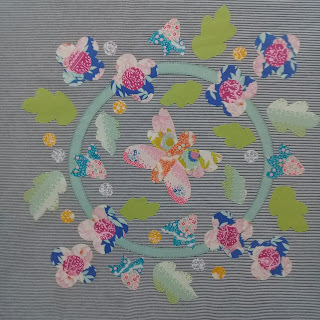 I decided I quite liked how organic it was, and that it was a shame to throw these things away at the end of the month, and that I should embrace the creative nature of them, which obviously reflects something about me too. So enters the new slightly formalised plan, starting with a monthly calendar sheet with space on the left to highlight key tasks and room on the calendar to identify steps to achieve those key tasks. 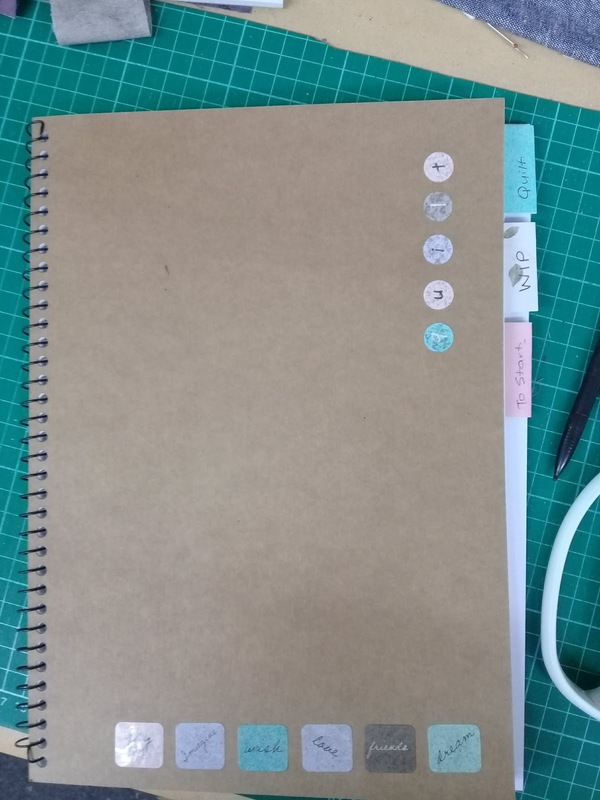 Stuck in with Washi tape, I have also left blank pages between the diary pages to allow for random additions. 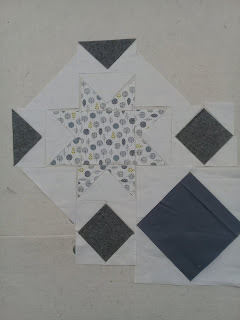 Then I have a bit of a serious looking page of quilts to quilt. 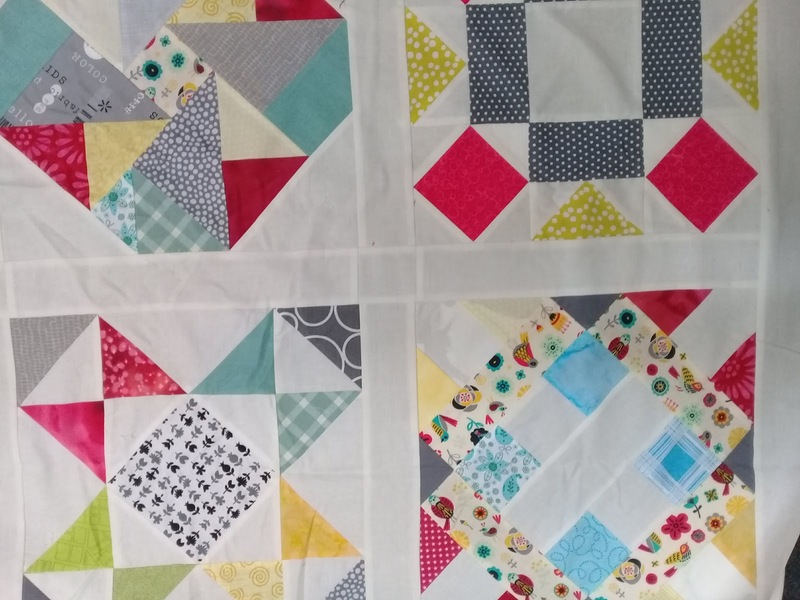 Because these all have the same steps to finish... baste, quilt, bind etc... 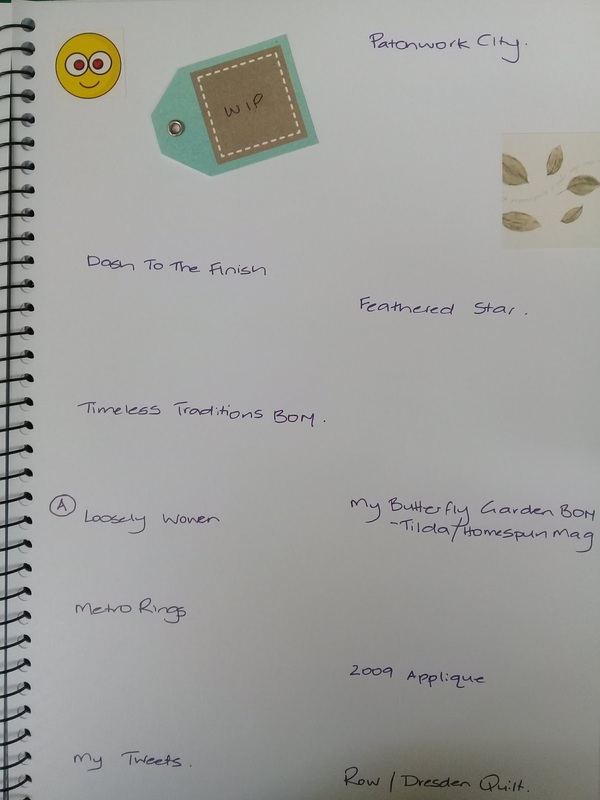 I decided to list these with the steps listed as tick boxes. 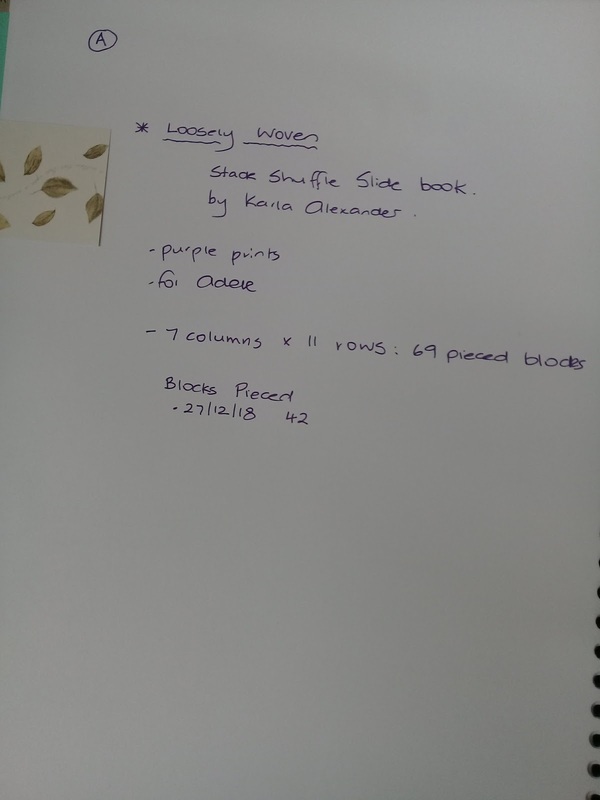 Which then has a corresponding page with more details about that project (where it came from or what it was inspired by)... what is required to finish that project, and how far along I am at the start of the year. 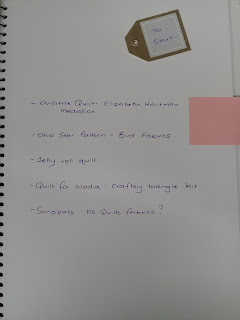 ... and any assorted planning paperwork also washi-ed into place. I do have a page of new projects... although in my defense some of these were on my last list of WIPs which is now several years old... and I figured if these projects were still taking up space in my brain they deserve to be done. 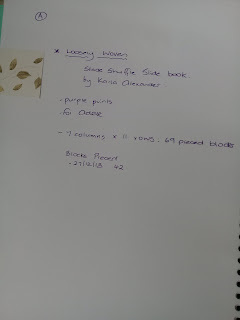 Still to add is a page with an assortment of household cleaning tasks (like cleaning windows), and a clothes sewing page... and I'm sure I will add other pages as necessary. I'm quite looking forward to 2019 starting so I can add my first month of tasks. Looking down the track to December 2019 I am hoping that not only will I have a pile of finished quilts, I will also have a great visual reminder of those projects and how they evolved/changed and hopefully got finished! Is it even really Christmas without Snoopys Christmas Song? 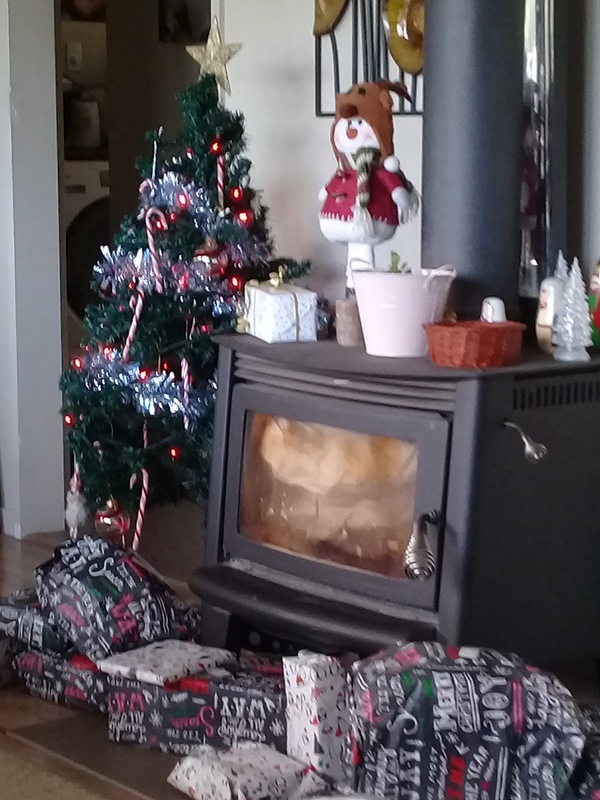 Another Christmas morning of presents and afternoon of eating... a good family time, and we've still got pudding to go! I've snuck in a touch of sewing... all's good with the world (well, apart from the weather). Wishing you all a safe and happy holiday time! 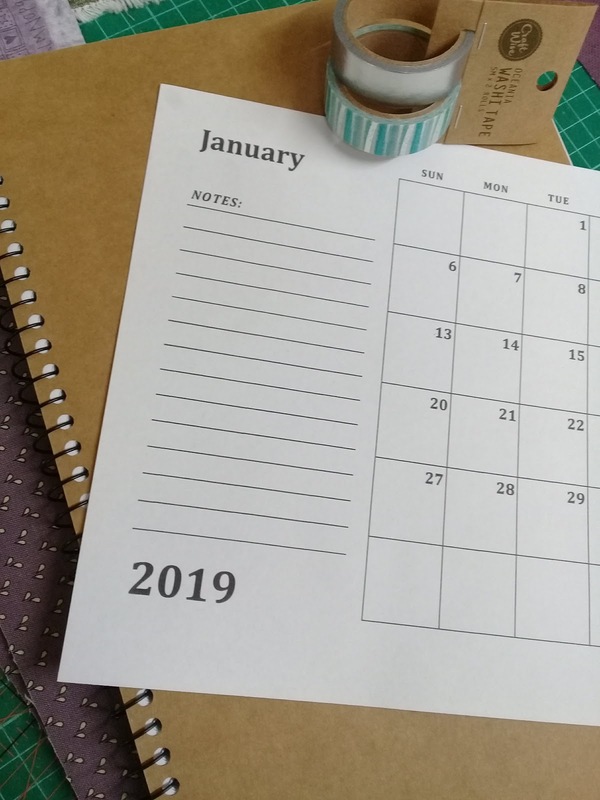 Midway through December and it's not going to be long before this year is over and done with; time to reflect on what we've accomplished this year and think about goals, hopes and dreams for next year. I started this year with the intention of focusing on my many sampler projects. 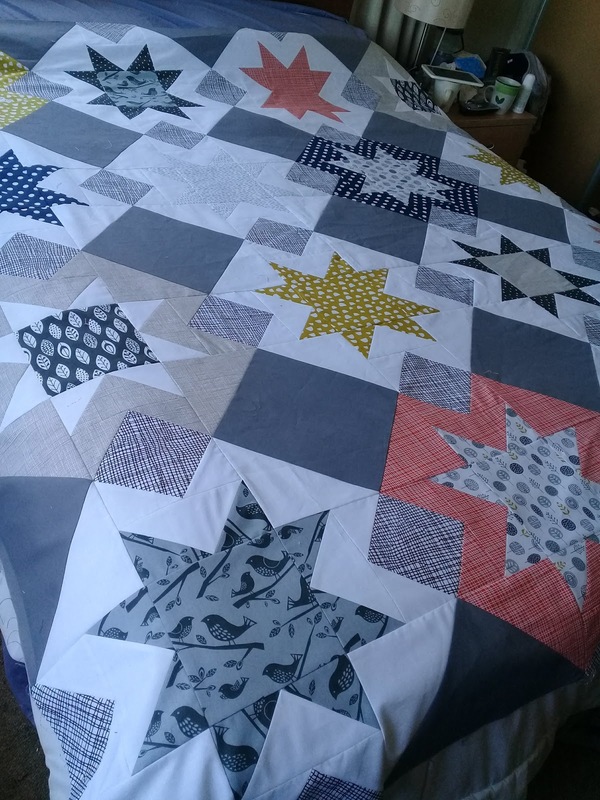 I did manage to get the Friends and Whanau quilt fully pieced which was major achievement. Unfortunately I started way more projects than I should have, but I have enjoyed each and every one so I don't see this as being a problem, but I do need to spend some time finishing things. 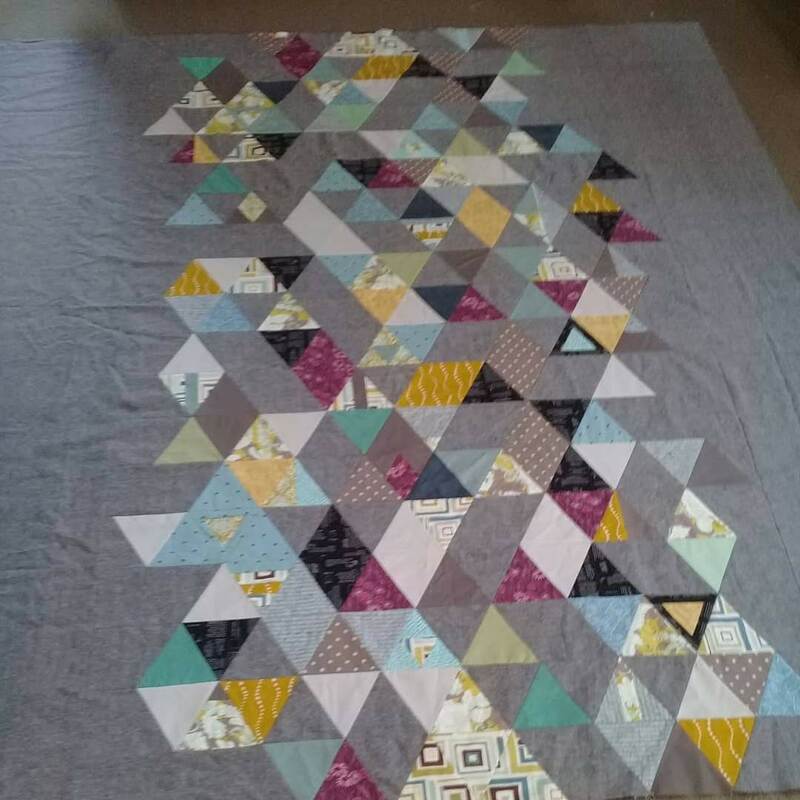 That leaves a whole heap of WIPs. Time to knuckle down and get some things finished! To achieve this I am contemplating using a diary system, and using the good old List to get things moving. 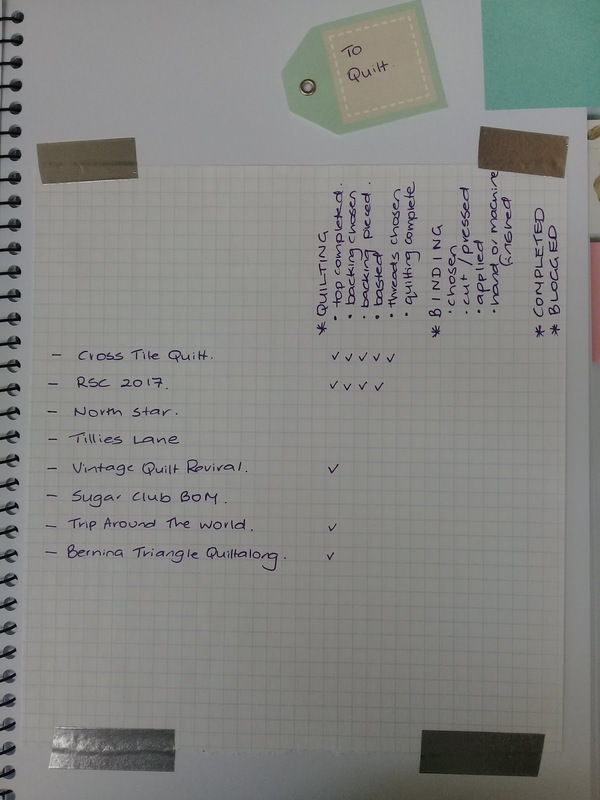 I know myself that using a list helps me to focus on what I'm supposed to be doing, usually on a monthly basis (which is why I find sewalongs and BOMs to be so successful). 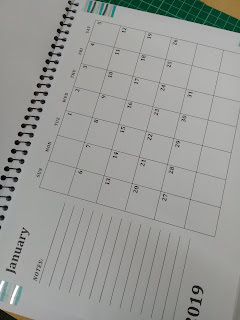 I'm thinking about breaking down my To Do List for next year into weekly challenges... and see what happens. On my Overall List I have a variety of projects... including some commitments, finishing some BOMs and some quilts I'd like to finally get quilted and finished. 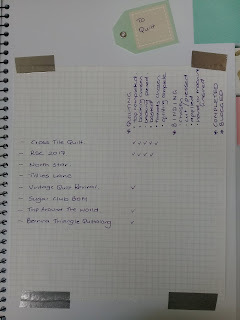 I keep thinking of projects to add... and I fully realise that I will never finish all those things on the list but that's ok... it is all progress. I'd like to get back into a better blogging routine, so maybe this will work with my diary system. Those close and dear to me know I am an enthusiastic shopper. 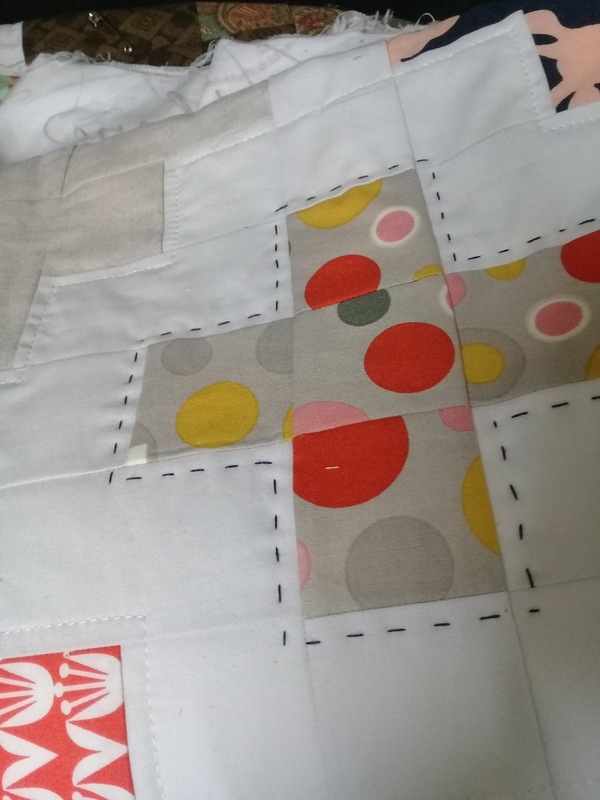 Both online and in-store, patchwork and nonpatchwork related. 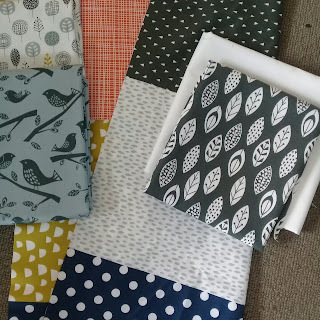 My fabric purchases are often of a similar nature... enhancing the stash, as opposed to buying for a particular project (although obviously that happens as well). 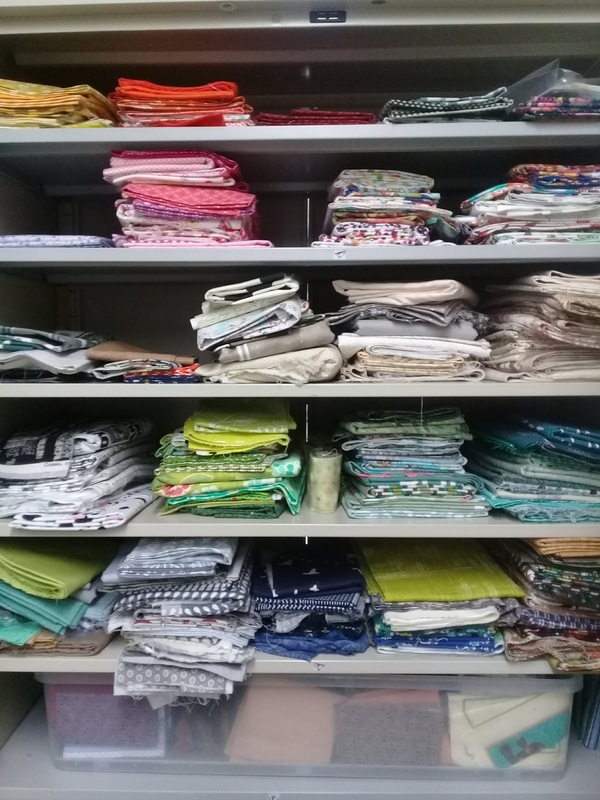 ... which I have roughly sorted into colour piles, and I realised that by taking a photo it doesn't look half as bad as you would expect... after acknowledging the enthusiastic shopping above 😆. 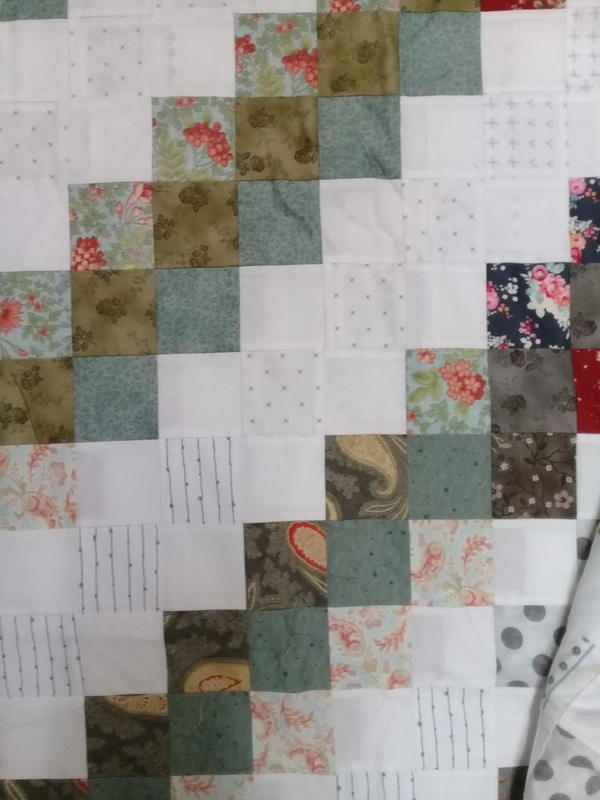 Not surprisingly I have masses of greens, neutrals and brown's and it looks super boring. Living in the country at least an hour's drive away from fabric supplies has shaped my process, if I see something and want to start... which is how things always start... the first step is to approach the cupboard and start selecting fabrics that make me happy. 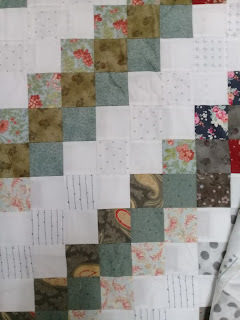 I also enjoy the eclectic nature of scrappy quilts, so having more variety of smaller cuts is never a problem. I purchase fabrics from three broad groups: backgrounds or backing, feature fabrics and generally useful. 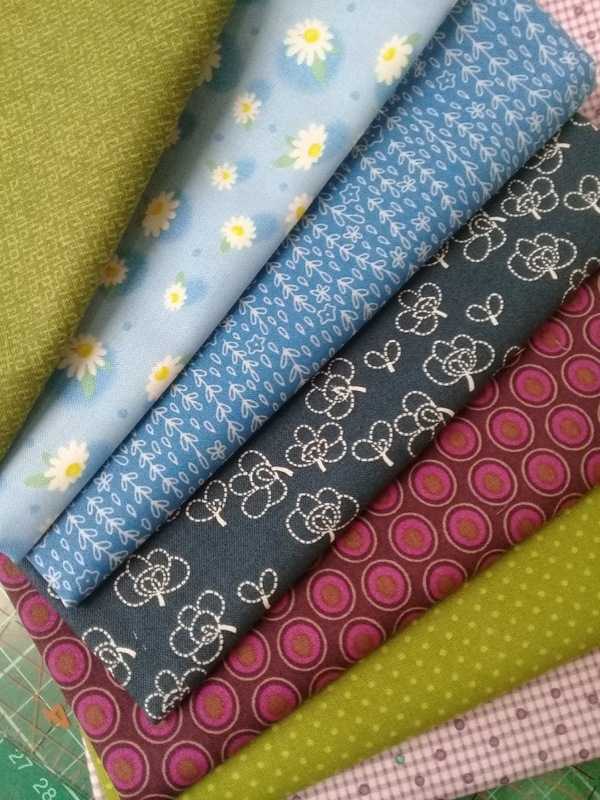 Having a selection of each of these main areas means shopping my stash can sometimes produce most of the supplies for an entire quilt! I recently received a package from an online shopping experience, which illustrates this. 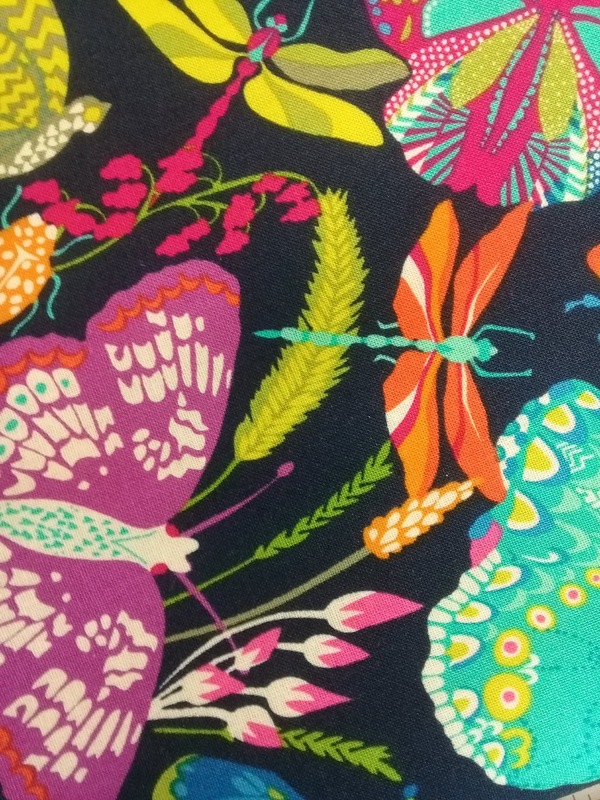 First up was this beautiful feature fabric chosen because it had a great variety of ontrend colours in a larger scale print. 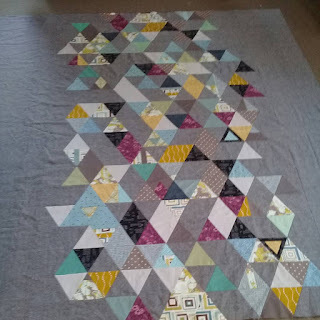 I bought enough it could be used as a feature or for borders, or as part of a pieced backing. Then I selected a variety of half metre cuts of fabrics I just liked. 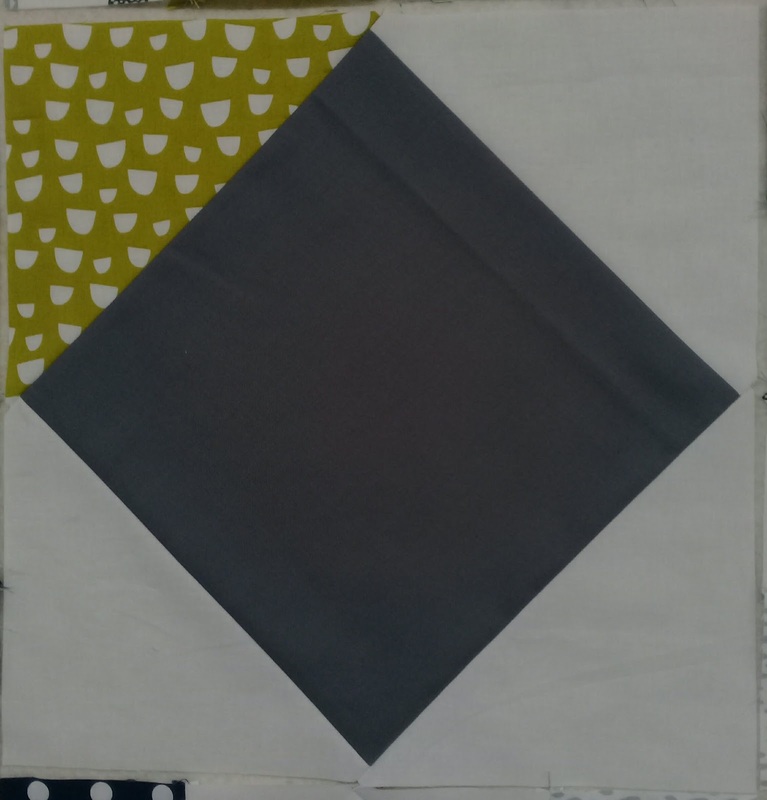 They tend to have smaller tonal prints and were not chosen to match with anything in particular. These are the useful bunch! I included some purples this time as I have hardly any in my stash, and you can never have enough greens. 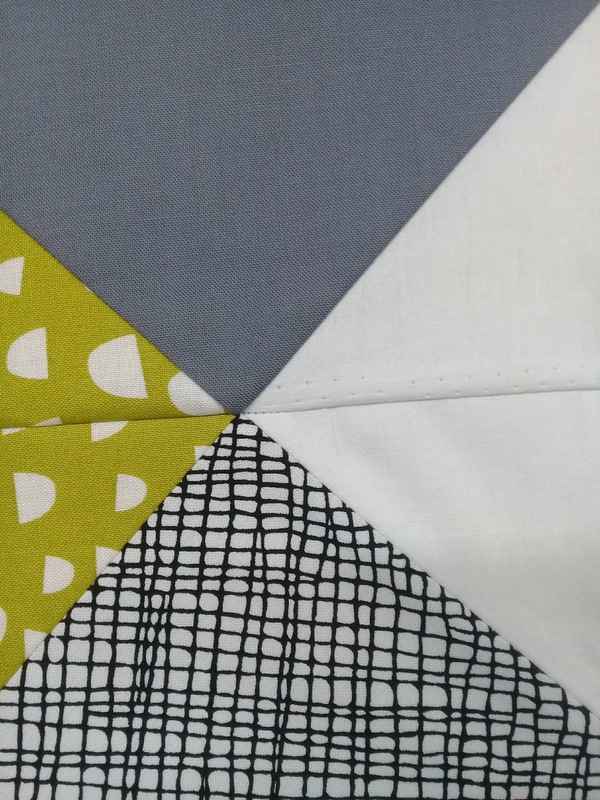 Navy prints are a new favourite (they now have their own colour pile separate from the blues) and amazingly I have few blues, but two piles of bluey greens... so more blue blues need to be purchased immediately! And lastly was a fabric chosen as backing. 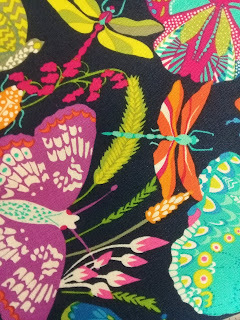 This was the only fabric chosen to hopefully coordinate with another project, as in general it is not so vital that the backing fabric be a perfect match to the front, and means that online colour variations are more acceptable. 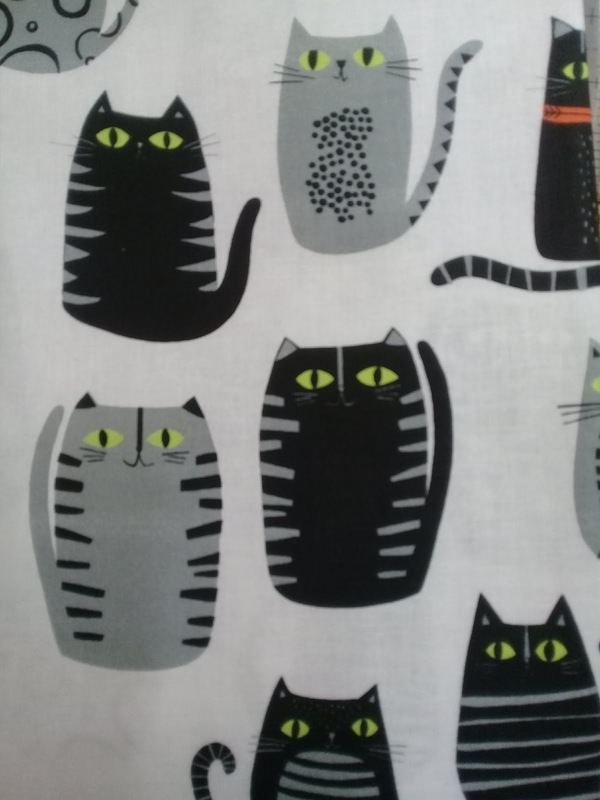 Assessing my online fabric selection, I am very happy. 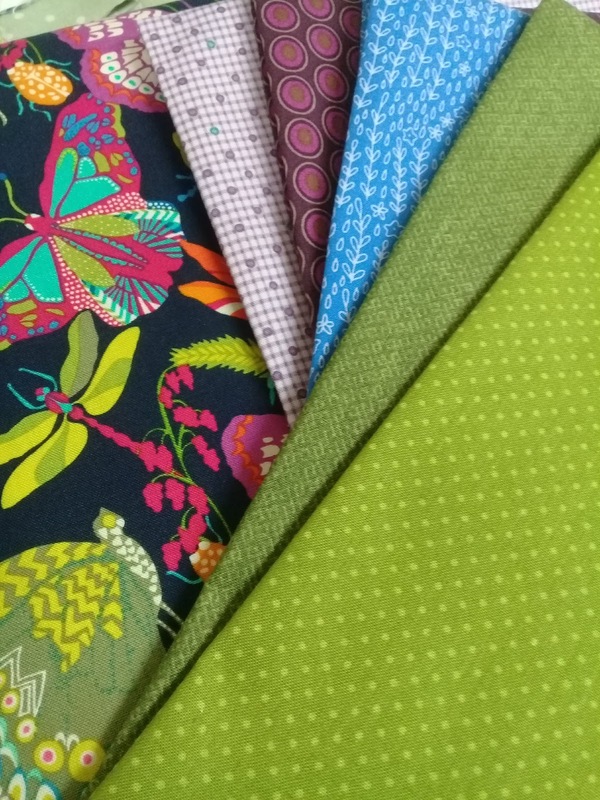 Quite by chance, these fabrics all combined nicely into a colourful bundle that would work well together. One of the greens has already been cut into to make bias stems and leaves for the Timeless Traditions BOM (photo coming soon😆) so that counts as a win in my book. 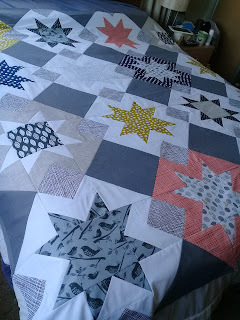 ... for the backing of the North Star quilt! 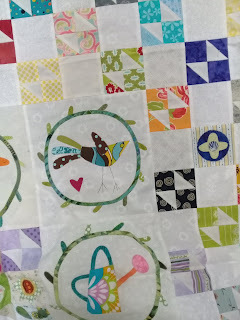 I still haven't decided on exactly what I am going to do with the butterfly print, but it would look dramatic and match beautifully as the backing to my Patchwork City quilt. We'll just have to see what happens. And now you know a little bit more about how my tiny pea brain works! For anyone curious, I didn't order anything over the Black Friday weekend specials, although I did a lot of looking! 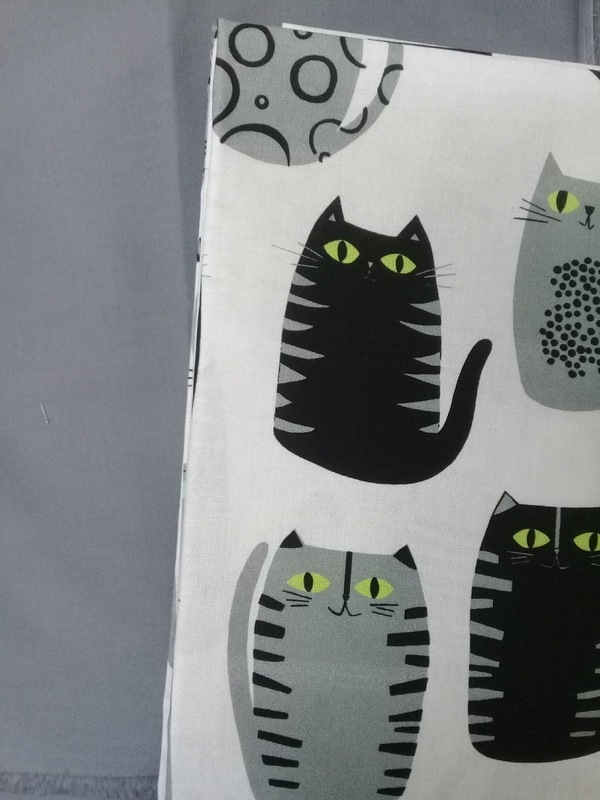 Post Black Friday I have ordered three different fabrics to add to my dressmaking endeavours, so fingers crossed when they arrive. 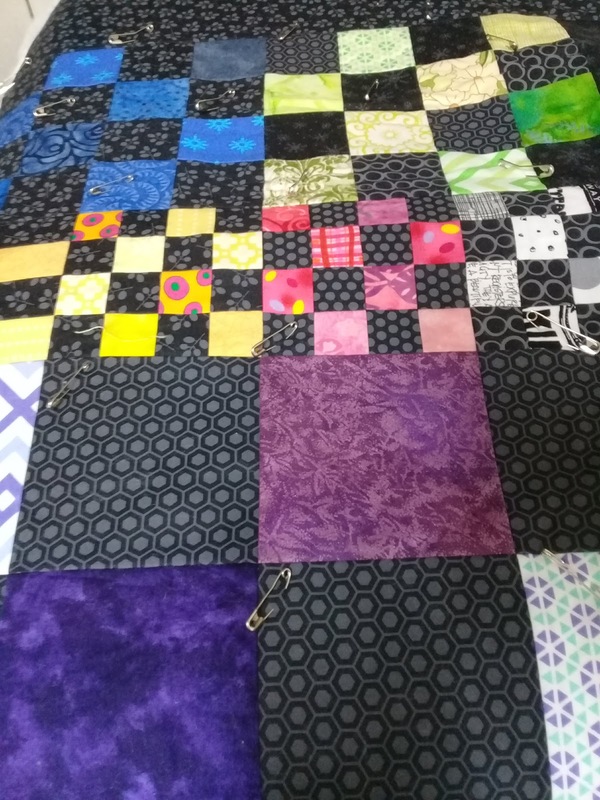 I am usually a block by block chain piecing quilter... not a deconstructed unit chain piecing quilter (as in sew together 376 four patch units). Of course there is nothing wrong with either approach... 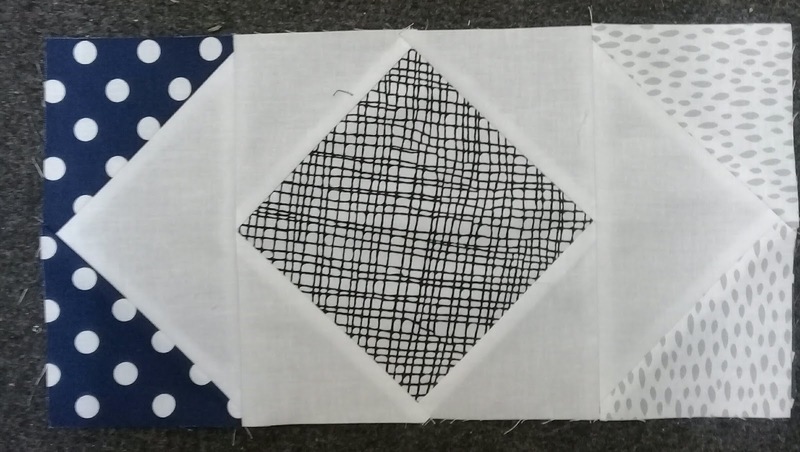 I've just found that cutting and sewing quilts in a block by block format works better for me, with my visual understanding of how blocks go together as well as my mental motivation. which I have purposely changed from being a block based quilt to a unit based quilt has been a mind bending experience. 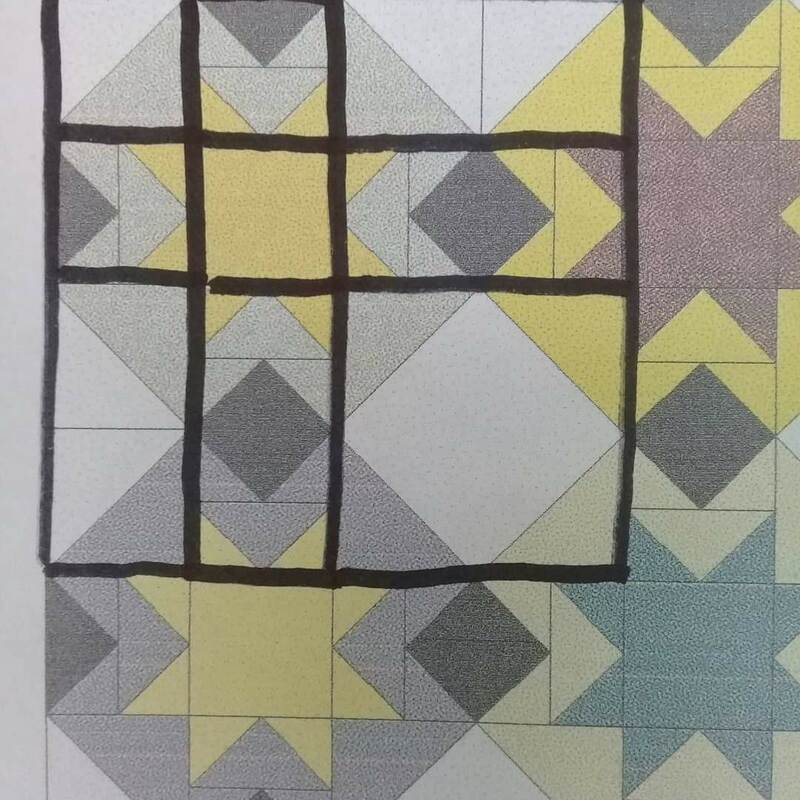 Which when combined in the right order and with some plain squares create these great star blocks. 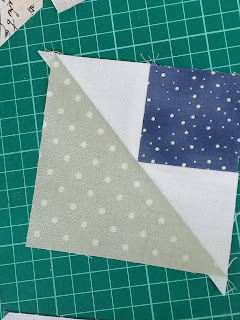 My usual To Do List method of getting things done would usually be like.... make 3 blocks this week.... but I'm not sewing blocks and that motivation just isn't going to work for me this time! 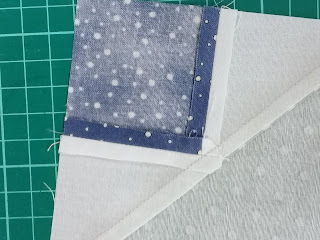 Funnily enough I have had to create random stopping points... because otherwise I just keep on sewing! Last weekend after spending way too much time and brainpower laying out most of the pieces, I decided to FOCUS and get the first two columns sewn together. 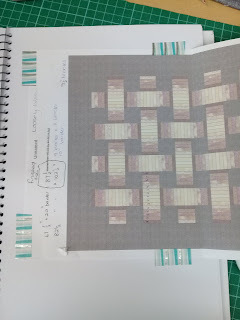 This weekend I am working on the third and fourth columns. 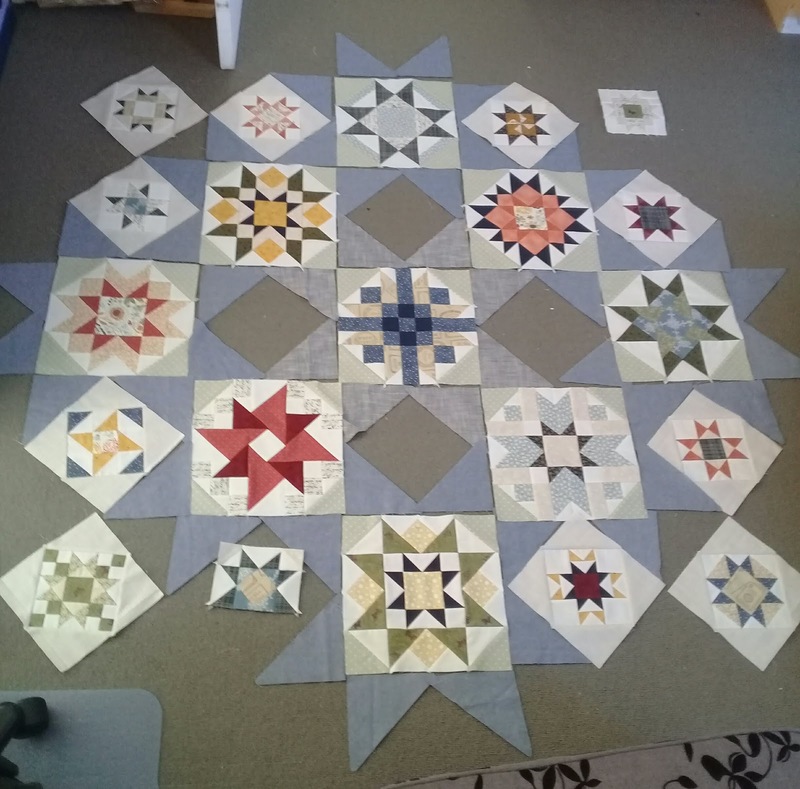 It is looking so good! My secret for sewing lots of things is that I just about always sew more than one thing at a time. If not three or four. As I need a new item to leave under the needle, at the moment I am slowly increasing the finished components of the Timeless Traditions BOM adding the blue star points. 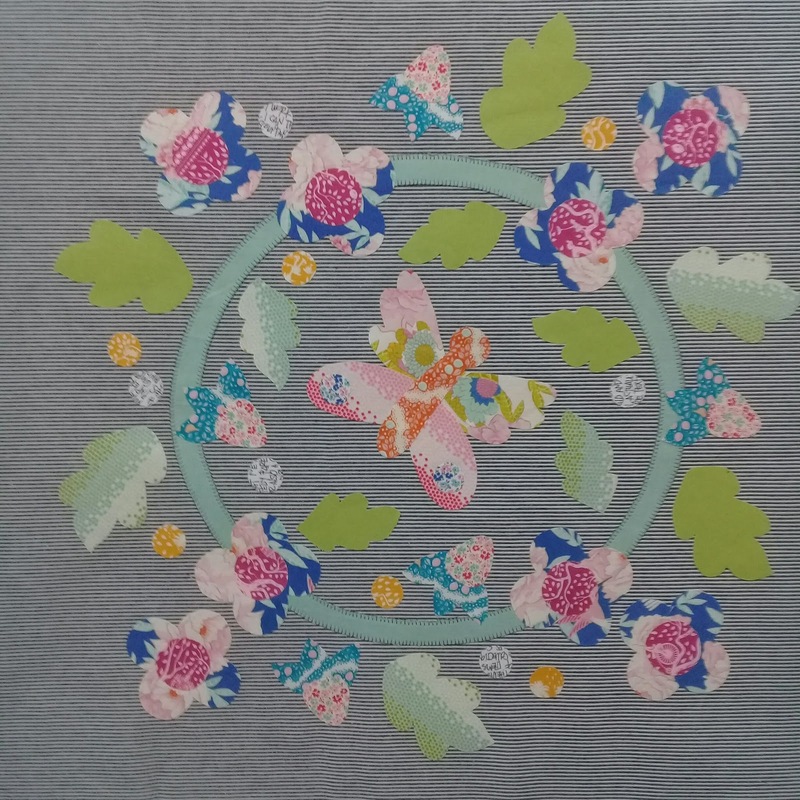 All applique elements are now on hold due to running out of fusible web! 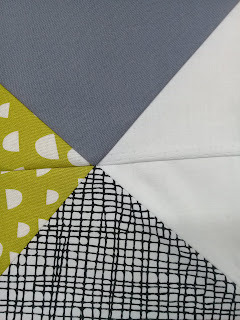 It took three days of colour coding my colouring page before I really felt ready to sew anything. This colour bundle consists of 4 fabrics, a light tree print, a mid denim blue bird print, a dark grey leaf print and a fabric printed with wide stripes of 5 different fabrics: green, orange, navy dots, light grey dashes and dark grey triangles. 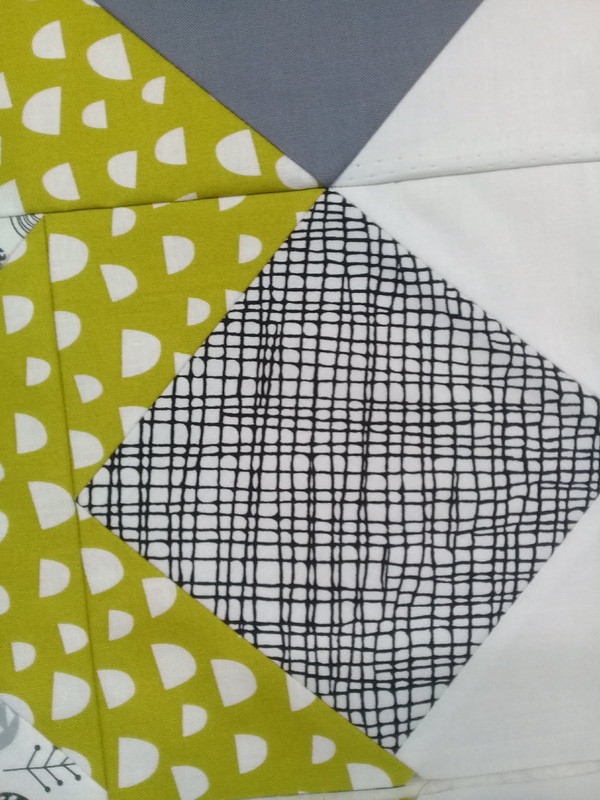 The big dilemma was how to distribute the colours around the quilt. I decided to feature the light trees in three star blocks. 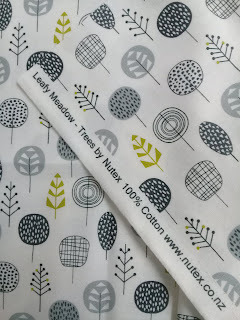 The tree print is particularly stunning - light and modern... just how I like them. 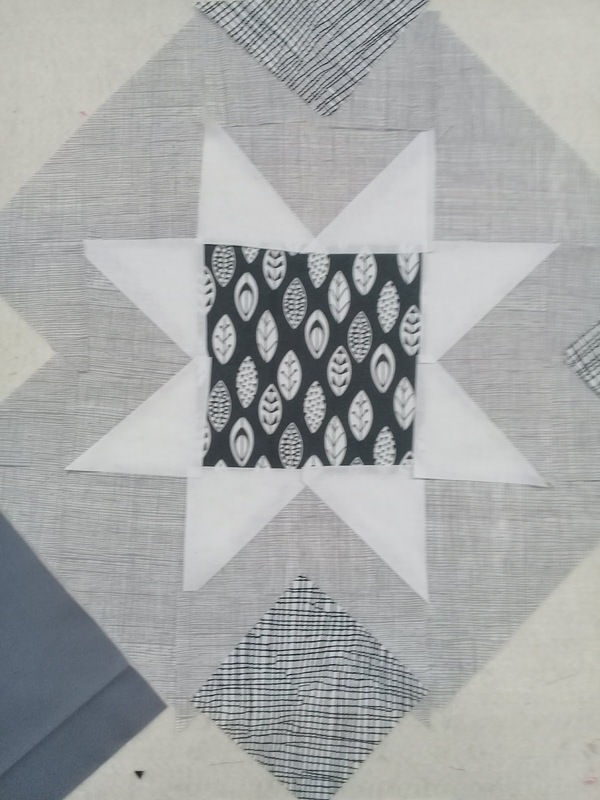 I originally thought I'd use a dark grey as the background, a black Essex linen as the contrast squares and white solid as the star surrounds. But... it looked super duper harsh... and boring - these are 18" blocks so that is a LOT of white and grey. Back to the drawing board. 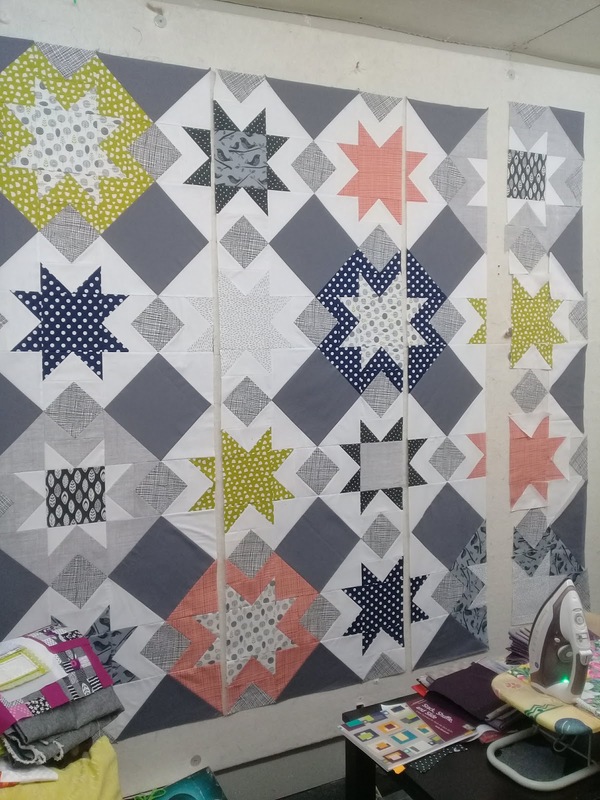 I altered my plan of attack so that the three tree star blocks would have the green, orange and navy fabrics as the surround, with most of the other blocks having white, but a couple of other fabrics thrown in randomly. I also pulled the Essex linen and changed it for this jumbo white and black cross hatch that was in my stash. 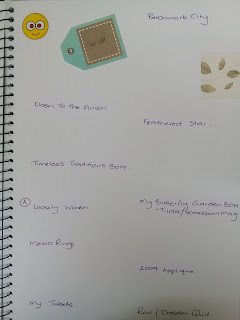 Right, I was now starting to feel like this was going somewhere good! 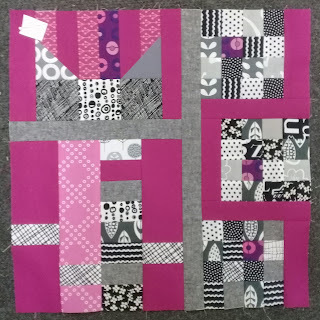 I decided early on to change the cutting instructions from the block in the pattern to one that used a square in a square block for the background squares and the contrast squares. I highlighted below how these new units would fit together. 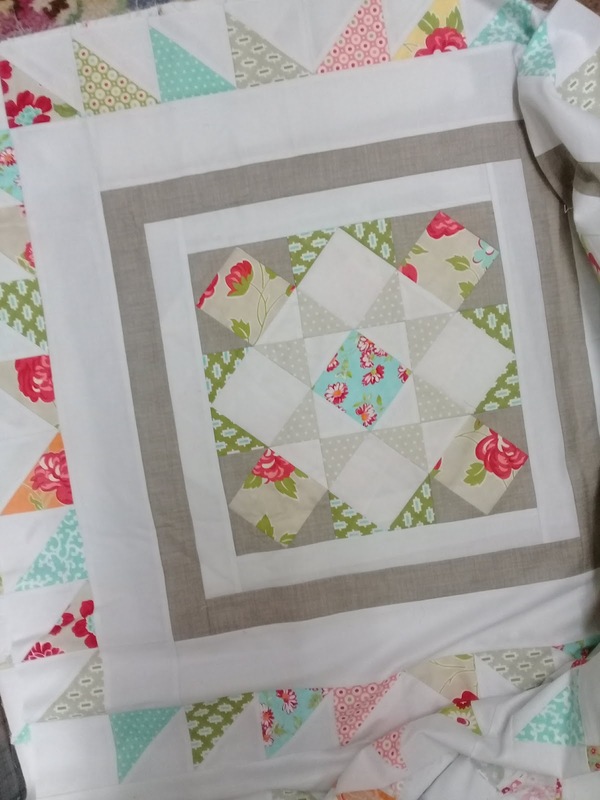 The original pattern is all half square triangles and I just wasn't going to go there without sashing! 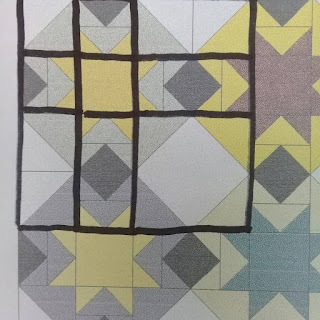 Those block intersections were just a pressing and matching nightmare. This also meant that I needed to decide ahead of time what fabrics were going to be in the adjoining blocks - hence the colouring sheets. 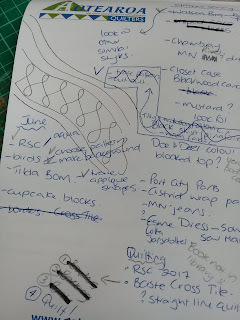 This is called Planning... and is really not how I approach quilt making normally. Anyhow, I got most of the first block sewn to see how the measurements and pressing stood up, and happily the pieces all fit together, and I'm just going to try one adjustment to my initial pressing plans, to see if I can get this seam easier to line up. Although it looks pretty good in these pictures! and this was the first attempt! And if anyone is interested, I still haven't filled in all my colouring sheet... but I have got far enough to keep making blocks for a few days before I need to reassess! 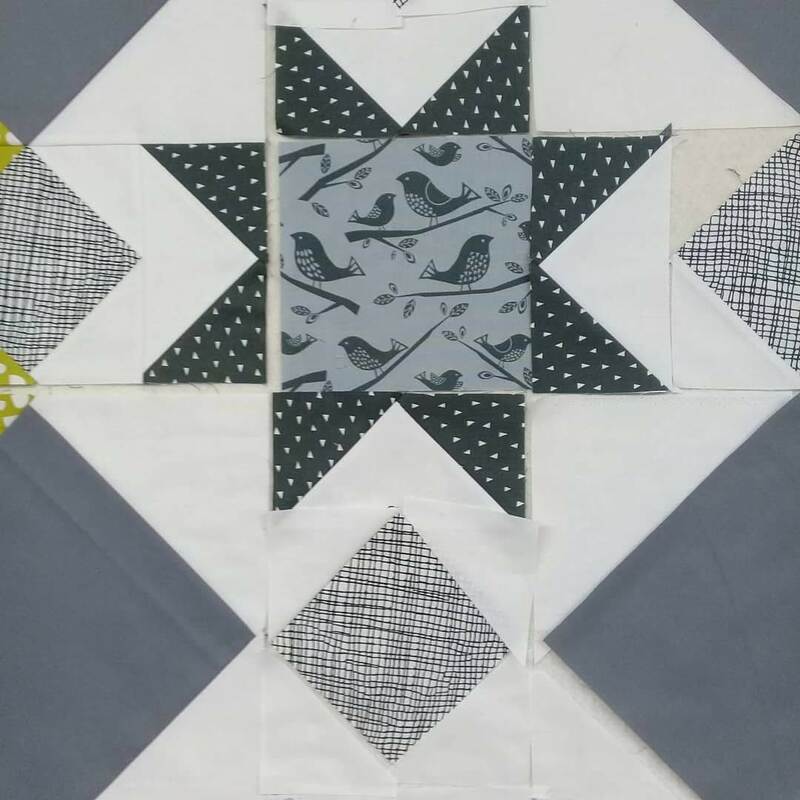 My normal crafting programme includes just adding new projects until the creative bubble bursts... and I return to focusing on a couple of projects until they are finished. 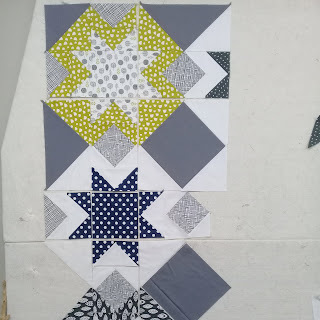 At the moment, I am still adding projects to my list, and wondering how close I am to that overflow situation. 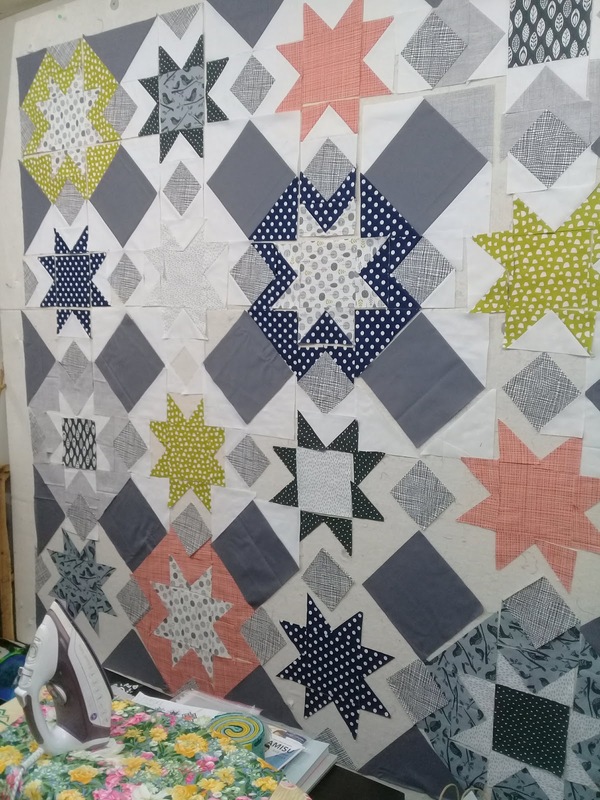 I have had the instructions for the North Star quilt by Emily Dennis for a while, and just haven't had the fabric or spark to get it underway. Last time I visited my favourite quilt shop, The Country Yard, they had in a new small line of fabrics that just had SUZANNE written all over them, and the North Star pattern leapt to mind as it is a simple yet graphic quilt, that would suit those strong graphic fabrics. Coincidentally, this pattern also started a quilt along on Instagram. 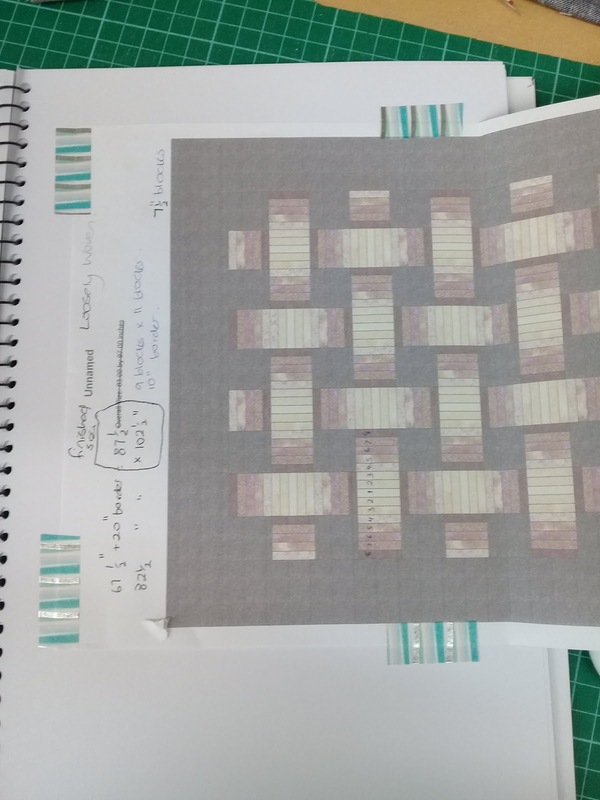 After a couple of weeks thinking and plotting, I was still no closer to working out how those fabrics were going to work, as I needed more variety as well as background and contrast fabrics. It was all a bit too hard and nothing was coming together. 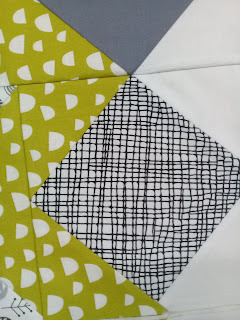 I finally decided to buy SOME of the fabric... not enough to finish the quilt, but enough to do some experimenting. 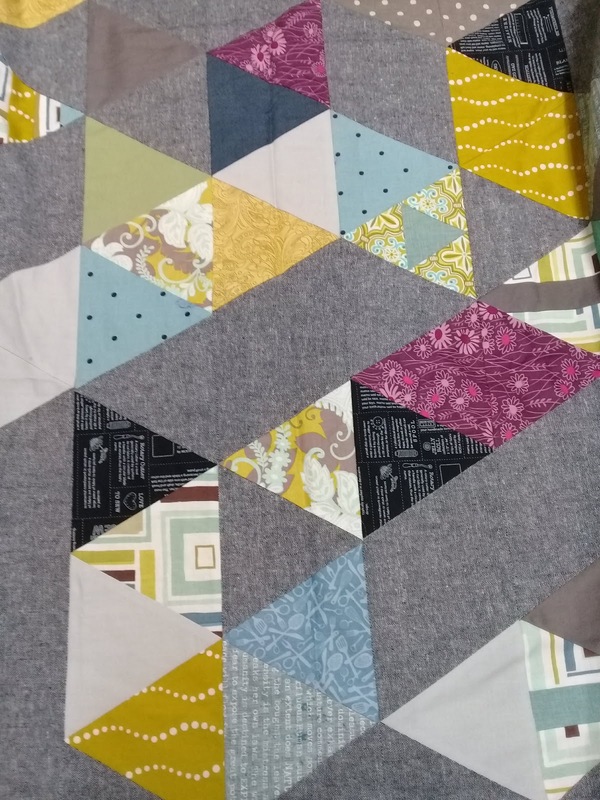 I was not prepared to give up on this one, and after looking through the quiltalong IG photos, I have found a slightly alternative colour layout that I can see working with my fabrics! I am beyond happy. 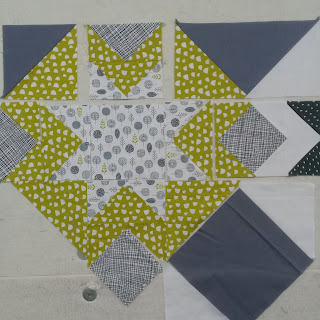 So today I caught up with the Month 7 block for the Tilda Homespun magazine BOM and got all my pieces fused. 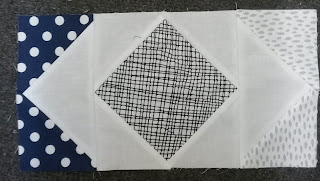 Now I can work on finishing the blanket stitch on Block 5 and 7. I think I also need to vacuum! 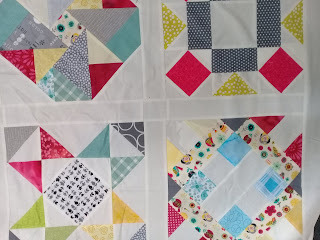 Tomorrow is a free day in my crafting schedule as the new weeks blocks for Patchwork City don't come out until Monday... so, I am going to have a little play with my NEW fabrics and see what happens. 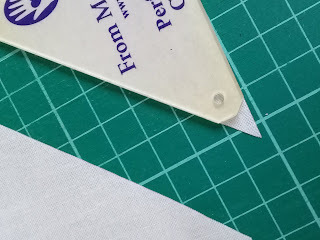 My favourite tool I couldn't be without! People often comment on my piecing accuracy and I think this is half because I am quite conscious of choosing blocks and quilts based on how blocks go together, and how easy they are to get good results, and half because I use triangle rulers and avoid many of the quick piecing methods. 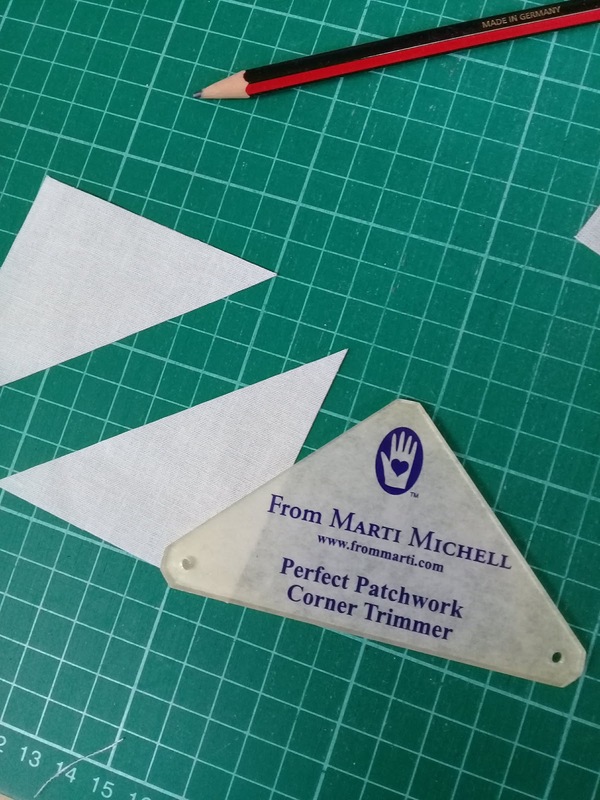 My all time favourite tool is this mini corner trimming ruler by Marti Michell. See how by lining up the edges of any sized half square or quarter square triangle it allows you to trim the bunny ears off? 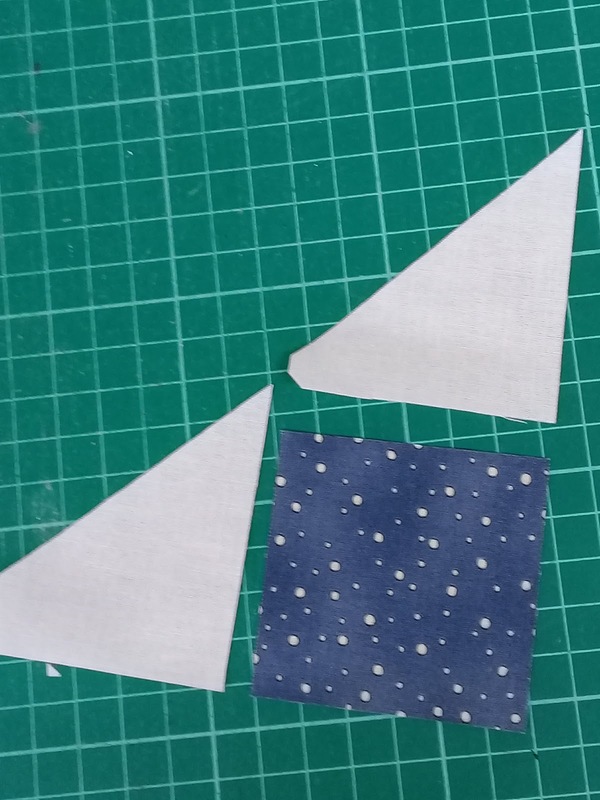 When sewing triangles onto a square in this formation, usually you need to guess how far the triangle needs to overhang the square and hope for the best. By trimming that end piece, it allows the triangle to fit perfectly aligned to the square. Woohoo... magic. 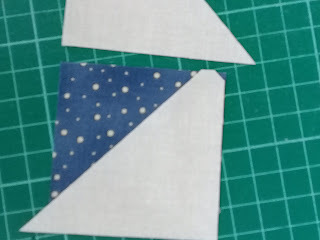 Pressing these units open makes them super flat but also gives great visibility for matching upcoming seam intersections. And a perfectly formed unit!